Without dating myself, the answer is yes. My first typewriter was a manual one. As a matter of fact, I think it’s still around my house somewhere. It was known as a portable and had its own case. Below is a picture of a similar one, but I recall the case on ours being dark brown on the outside and light brown on the inside. It belonged to my mother and she bought it long before I was born. I can still remember the smell of the ink ribbons. Just writing about it this morning brings back the memories and I swear I can smell it. I also remember my fingers getting stuck between the keys when they slid off. And reaching for the carriage return arm to return the cartridge to the start position when you got to the end of the line of typing. No wrapping around on these babies. 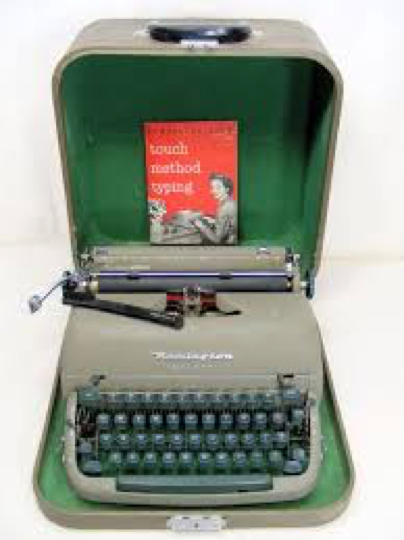 In high school I was one of the fortunate ones and landed in the typing class that had the brand new electric typewriters. I have to say there was a learning curve. No longer did my fingers have to be strong, nor did they get cramped. I did find myself typing multiple of the same letters at first, because I kept my finger pressed too hard on the keys. 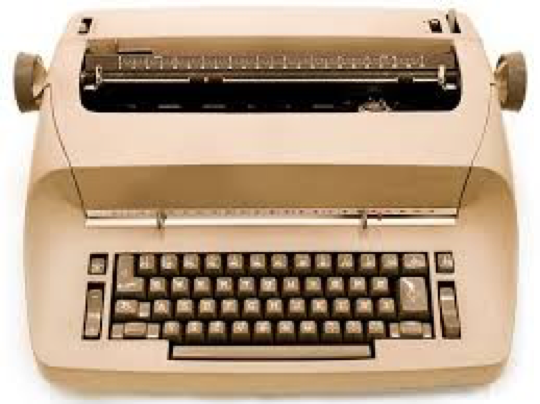 Below is the model I started with an IBM Selectric. Imagine not having to take your hands off the keys to return the carriage to the left hand side to start the next line of typing. I thought I had died and gone to heaven. My speed and accuracy also increased. I left high school typing near 100 words per minute with high accuracy. Then I started to work and they were just getting into computers. I worked at that job for a number of years. All of our typing was done using a computer program that did word processing. It took some time to get used to never having to hit the return key because the computer did that automatically for you. Quite a number of years later I applied for another job and it included a typing test. They told me the machine was a word processor. My experience with a word processor was just sit and type and the word processor would look after wrapping your text. I did a five-minute typing test and because I was a touch typist, I typed the entire text of what they had given me without looking at the paper in my machine once. Imagine my surprise when I looked up and the word processor did not automatically wrap my words and all of the text was typed in the same spot on the end of the first line! Needless to say I didn’t get that job, and I was mortified when I realized what I did. Chock that up to experience. I never forgot that typing test or the lesson it taught me. I am so thankful for innovation. The first computer I worked on took up a whole large room to run less memory than I have on my current laptop which takes up less than 2 square feet on my desk and weighs next to nothing. I don’t think my fingers would be able to type one paragraph on that old manual machine these days, but I do wish I had an old antique one in my office just for show. Maybe I’ll have to look and see if that old Remington is still around.